I have reached new heights in spangled frivolity. I am seriously considering painting my kitchen pink. I have made a lot of changes and updates to my place since moving in last fall but have yet to touch the kitchen. At all. And it could use some work. I have been avoiding it because the kitchen is used so frequently and I don’t want to be tripping over paint brushes and tile grout just to make a piece of toast….but now I realize it will never get done unless I crack down and do it, so, this week I find myself with kitchen décor on the brain. 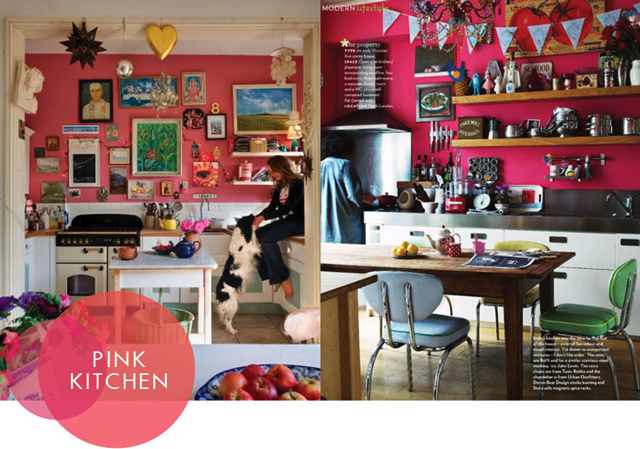 Despite a plethora of amazing ideas out there, I keep circling back to the idea of a pink kitchen. My Grandnanna had a pink kitchen (not Pumpkin, the otherone) so the idea is not exactly new. But it’s a little scary. Not that I have ever been scared of color, you know, it just the thought of stumbling out of the bathroom each morning to say, WOW THAT’S A PINK KITCHEN! I like pink. A lot. Hot pink especially. 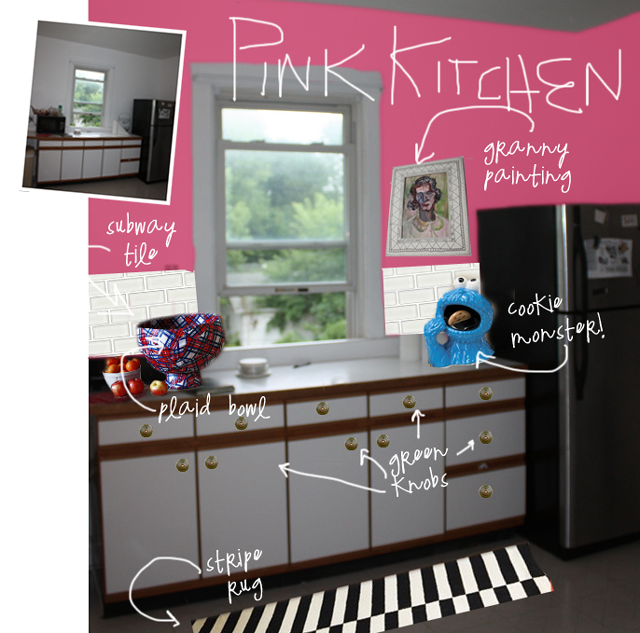 Pinks walls will distract from the dingy, outdated, 100% paint resistant melamine cabinets. Pink walls are a nice, feminine, foofy counterbalance to a room filled with sharp, masculine, metallic, and dangerous objects; in fact, if there ever was a room that could handle pink –it’s the kitchen. It’s only paint. If/When I have the time/money to do a thorough renovation I can do something more classic, but for now it’s fun. I will be known as The Cat Lady With The Pink Kitchen. Yup. So that seals it: I’m getting a pink kitchen. make your own pink chalkboard paint and roll yourself in weirdness like a pig in mud. Pigs are happy in mud. Can’t see anything wrong with it! Peruvian Pompom sounds ace, by the way. It sounds so… you! As the owner of both a pink kitchen (magenta) and a cat I support you 100 percent. Why not? The kitchen on the left looks like you live there already. I like the First Kiss, but the Peruvian Pompom looks like it has too much gray. I have a Peruvian derby hat that is bright hot pink. Tip: buy little samples and paint big swatches on the walls. Check the color at different times of the day. And you know of course that if you have large walls, the color intensifies. I have seen your same cabinets redone. I think they painted the wood trim white. Of course you know that any good paint store can take any color and make paint to match. Check your dump. A lot of cities have oops paints for sale for cheap. Like Portland, of course. dooooo itttttt!! i know you’ll make it sparkletastic 🙂 can’t wait to see the results!! Perfectly fun and full of life! But, BTW you can paint those melamines! I did mine – 2 coats BIN primer, 2 coats latex wall paint, 3 coats poly finish. They have stood up to 10 yrs of abuse so far. And nobody can believe they aren’t all wood! Check out Valspar’s First Kiss – woooeee! Go for the pink! My granny had a hot pink bathroom…a tiny hot pink bathroom.. Not a fun thing to turn on the light in the middle of the night! My grandpa had a night light installed so we could see without being blinded. My dining room is Benjamin Moore “Hot Lips”. It is a very saturated dark fuschia. Warning – if you are going to paint a wall a really deep or bright color, you need to do a tinted base coat, then a second, top coat. (Think like nail polish). Ten years later, the color still thrills me.